Scientists like to categorize life on Earth into “biomes”. This is just a fancy name for regions characterized by similar biological and physical characteristics. For example, rain forests, temperate forests, savannas and deserts are some of the most well known and explored biomes. Little is known however, about many biomes of the oceans. Just last week, scientists from NOAA and Texas A&M- Corpus Christi revealed data suggesting that oceanic seamounts comprise one of the most widespread and diverse biomes on Earth. Seamounts are underwater mountains which rise from the ocean floor but do not break the water’s surface. Most often they are extinct volcanoes, as in the emperor seamounts which are an extension of the Hawaiian Islands. Previous perception has been that seamounts were isolated and remote, but this idea is gradually changing. 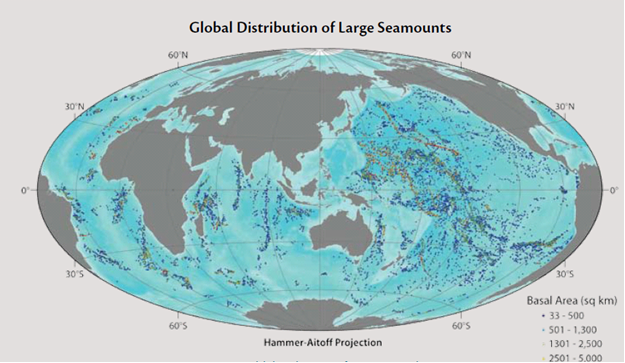 In their paper published last week in Oceanography, Peter Etnoyer, John Wood and Thomas Shirley claim that seamounts cover a substantial portion of the Earth, an area collectively larger than Australia. Their study used “satellite altimetry”, where specially-equipped satellites use radar beams to measure the elevation of the earth and sea level to within a few cm of accuracy. The use of satellite altimetry on the deep ocean floor is less precise, so the researchers looked for the most prominent seamounts rising at least 1000 meters. They counted about 11,880 of these worldwide, covering a cumulative area of 9,938,000 square kilometers, and that is their conservative estimate. That would make seamounts one of the most prevalent biomes in the world, ranking about even with the global extent of tropical humid forests, temperate broadleaf forests and wetlands. Although organisms living on many seamounts never see sunlight, are surrounded by cold temperatures and high salinity water, and must rely on material falling from the surface waters for food, these elevated regions are undersea islands of biodiversity, sustaining much more life than surrounding seafloor. Only 200 seamounts have been thoroughly explored, but new species have been observed on nearly every submarine dive. In the Gulf of Alaska, two dozen new species of corals and sponges have been collected from seamounts since 2002. This study demonstrates that rather than isolated features, seamounts often occur in dense clusters which vary significantly in size and number. The densest aggregation of seamounts is in the center of the Pacific Ocean where they are concentrated in a region exceeding the area of China. According to Project leader Peter Etnoyer, “Unlike beaches or coral reefs, most people will never see a seamount, but this study shows that they are clearly one of the predominant ecosystems on the planet”. Entnoyer, P.J., Wood, J., and Shirley, T.C., 2010, How large is the seamount biome? : Oceanography, v. 23, p. 206-209. Automatic Scuttle Submitter is 100% automatic social bookmarking software designed to submit your domains to thousands of Scuttle sites. Not only Automatic Scuttle Submitter creates accounts and bookmarks sites automatically, but also parses meta tags for each URL and runs itself in background without any user interaction. It sounds interesting but I am not sure that I agree with you completely. Think of how retarded the average guy is, and realize half of them are stupider than that. Appreciate your post very much. Love how the Internet helps many people find awesome training content like yours regarding our industry! Keep up the great work! Why didn’t I think about this? I hear exactly what your saying and I’m so happy that I came across your blog. You really know what your talking about, and you made me feel like I should learn more about this. Thanks for this; I’m officially a huge fan of your blog. Scuttle submitter is enormously powerful, 100% automatic social bookmarking software which will build UNLIMITED number of top quality backlinks, send first-class traffic in minutes, increase your affiliate sales, AdSense income and site revenue as much as never. Social Bookmarks Demon combines features of ALL social bookmarking tools available in the market for price of single tool. Post trackbacks and comments to remote blogs automatically with Scuttle submitter! This tool will submit your comments to millions of blogs automatically. Scuttle submitter – the most powerful tool on the planet to submit trackbacks automatically! Wouldn’t you mind if I place a link to this post on my_site? This web site truly has all the info I wanted about this subject and didn’t know who to ask.